Institute have agreed a ground-share arrangement with Glentoran for use of the Oval for the 2018-19 season but are continuing to explore options to play their 'home' matches in the north west. 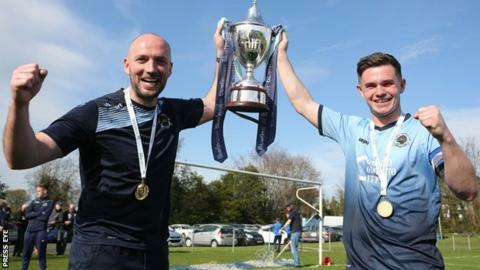 The Championship club secured their return to the Irish Premiership after a three-year absence by beating Loughgall 3-0 at Wilton Park on Saturday. The victory saw them crowned champions. They have been unable to play at their Drumahoe ground this season because of serious flooding last August. With the Riverside Stadium unavailable, Stute have been playing their home games at the Limavady Showgrounds and Wilton Park just outside Londonderry. Given that a return to the Drumahoe venue any time soon seems unlikely, Derry City's Brandywell home ground has also been suggested as a possible location for Institute's top-flight home fixtures next season. Chairman Bill Anderson described the new-look Brandywell as the "natural option" for Institute's home games but said that policing concerns and costs involved complicated that scenario. "We made the decision on the basis that maybe half the teams we will be playing are down in Belfast anyway," said Anderson. "We're hoping not to travel there. We are hoping to have something resolved by then." The club were officially granted their 'Promotion Club Licence' on Wednesday, along with Newry City, who are set to be involved in a promotion/relegation play-off with either Ballinamallard United or Carrick Rangers. According to a statement released on the Irish Football Association website, Institute are continuing to "actively explore options to secure a 'home' venue (meeting the current Premiership ground criteria) in the North West of the province and continues to liaise with both the IFA and Northern Ireland Football League in this regard". The club had suffered the heartbreak of losing in the Premiership promotion/relegation play-off over the last two years.